The Follow a Museum Day 2017 (February 1) campaign started on December 7, 2016 with the main aim to draw attention to the participating museums and their current exhibitions. A great day for museums! What is Follow a Museum Day? 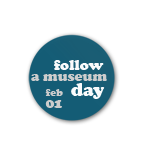 Registration for »Follow a Museum Day 2017« is open!